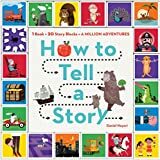 How to tell a Story (Workman Publishing, $19.99 ) is a simple idea. Writer Daniel Nayeri has created a book-shaped package featuring 20 beautifully illustrated blocks. The blocks can be played with on their own, or as designed, used to stimulate the creation of stories by kids and parents. Each block, designed by Brian Won, is illustrated with a different color on each face. The colors help guide subjects (red and blue) and the action (green). Other colors, orange, purple and yellow represent other key story elements such as place and emotions. The combination of color and illustration helps guide story-making in a way that goes beyond random images strung together. While the box says for Ages 9+, younger kids will enjoy the illustrations and should be able to quickly grasp the idea. Younger kids are often better at concocting stories with a little help. The included story creation book is designed for the older group. It explains the concepts behind story-telling: plot, dialogue and characters. This is a good present for both kids and dads who like to invent stories to tell their kids. Who knows? A story block adventure might just turn into the next American novel.